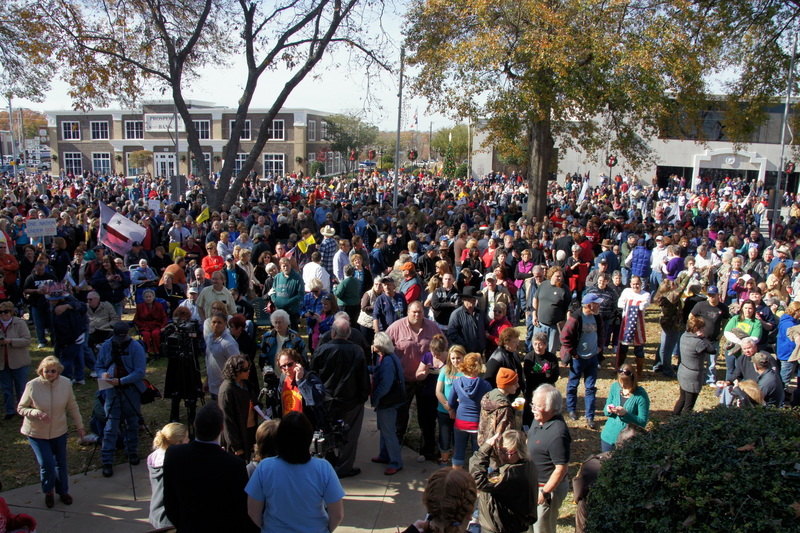 It may not have been a miracle feeding of the 5,000, but nonetheless, on Saturday, December 17, 2011, over 5,000 people gathered for a rally in support of Jesus on the Henderson County courthouse lawn in Athens, TX. More specifically, they were gathered in support of the manger scene on the southeast side of the square which has been a local tradition for decades in this quaint East Texas town near Tyler. The “Rally for the Nativity” was planned as a response to a letter from the Freedom From Religion Foundation, a Wisconsin group who has demanded that the nativity scene be removed from the courthouse lawn. The group stated that they were acting on behalf of a Henderson County resident who objected to the display because of its religious message and that it was displayed on county property. After county officials refused to remove the nativity scene, the FFRF changed direction and sought to have a banner of their own displayed. The banner read, “At this season of the Winter Solstice, let reason prevail. There are no gods, no devils, no angels, no heaven or hell. There is only our natural world. Religion is but myth & superstition that hardens hearts & enslaves minds.” The banner was briefly displayed but soon removed by Sheriff’s Deputies because it had not been properly approved by county officials. The Wisconsin group may have gotten more than they bargained for as this challenge appears to have emboldened this conservative community and make them even more resolute in their determination to oppose the FFRF’s efforts. 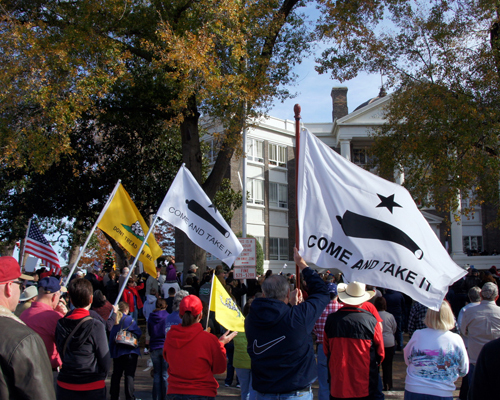 At the rally, the courthouse lawn and surrounding streets were filled with praying Christians and their supporters, waving American flags, Gadsden flags and the famous “Come And Take It” flags from the days of Texas’ independence in 1836. The hour-long rally was an act of solidarity among conservative Christians and Constitutionalists who are fed up with attempts to neuter their holidays and remove all religious references in the name of the establishment clause. They point out that the Supreme Court has previously ruled that nativity scenes on public property are perfectly legal when accompanied by other secular holiday symbols such as Santa Claus, carolers and reindeer, which is also the case in Athens. It appears that the nativity scene will remain on display throughout the holidays, but this controversy is far from over. The FFRF vows to return next year, follow procedure and request permission for their banner be displayed from the Henderson County Commissioners’ Court. It remains to be seen how the residents of Henderson County will respond, but it is almost certain that they will not only look to Austin for help, but to their Heavenly Father as well. God Bless Texas! Thanks for being there! Great Article! Thanks for being such a strong voice for the community Pastor Lorick. Please keep us posted on any updates.